MV AGUSTA'S F3 ‘Solar Beam’ – in the same yellow as the Mercedes AMG GT – will go into production this year, the Italian firm said yesterday. The AMG-liveried F3 was unveiled as a concept at the Frankfurt Motor Show in September to celebrate the partnership between the two firms. It’s to become a limited-edition production model and will be one of six new MVs this year, three of them nakeds and three sports bikes. The news was announced by MV Agusta president Giovanni Castiglioni in Malaga at the launch of the Brutale 800, which uses the engine from Turismo Veloce. He said the F3 Solar Beam would be the ‘first production bike that will link the two brands together’. 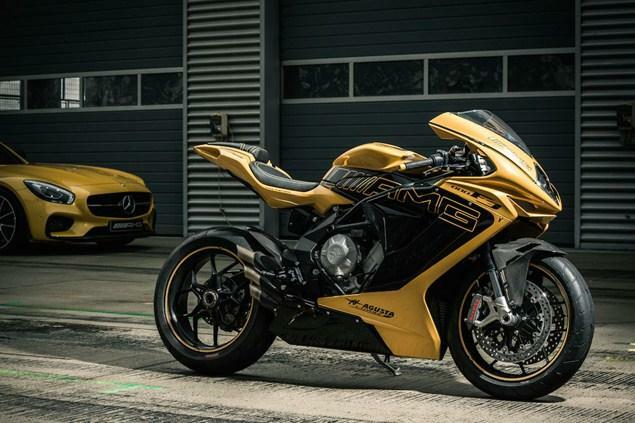 Castiglioni said there were also plans to display MV Agusta motorcycles at 127 AMG dealerships across the UK and Europe. Among the other six new MVs will be updated versions of the Brutale 675 and Dragster 800, with similar revisions to those made to the Brutale 800, including more advanced electronics and engine modifications aimed at improving mid-range torque and meeting Euro4 emission limits. Visordown is riding the Brutale 800 in Malaga today and will bring you a full review tomorrow.